The 10th Perimeter Relay on Saturday was the most difficult one yet. The start at Sinalei Reef Resort was easy enough in the cool of the morning. Then the heat hit earlier than usual and it did not let off. It was not enough to deny all eight teams from a glorious finish at the Tanoa Tusitala Hotel in Sogi. Team Happy Feet, a collection of 40-something and the sole Masters team in the relay kicked off the 10th Relay at 2am. They finished thirteen hours later at 3.30pm in the afternoon. Other teams included five Mixed teams and two Open teams. The Japanese team was not far off from claiming overall victory but the all-male Ford Hyundai Samoa Team made sure of their victory with a determined run from behind. The team was last to start at 6.45am, just behind Fatu Toa the other Open team. Those two teams had a decent tussle from Le Mafa Pass to Lauli’i. Ford Hyundai’s last two runners of Shane Paulo and Steve Nimarota wanted to win this one after three years of anchoring the Ford Relay. It was not all pain in the relay. There was a meaningful purpose too. The Hash team used the relay to fundraise for the Goshen Trust. The Hash relay circled the entire island of Upolu, all 180 kms. First, a group of 20 walkers started out in Apia on Friday night and traveled west before finishing at Sinalei in time for the handover to the relay runners at 6am. 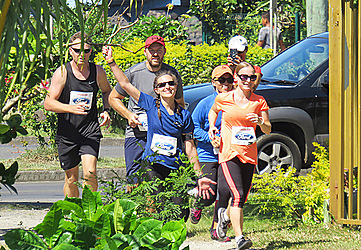 At the finish on Saturday afternoon, members of the Goshen Trust joined the relay runners in the last 500 meters to finish at Tanoa. Last year, Apia Hash House Harriers raised thousands of dollars for Goshen Trust in the 2017 Relay. The relay was started by the U.S. Vets in 2009 and is now managed by Samoa Events.